Nearly 7,000 are dead from the Ebola outbreak in West Africa, according to a new report from the World Health Organization (WHO). The report shows a jump of just over 1,200 dead since its previous report on Wednesday. More than 16,000 people are diagnosed with Ebola, with the majority coming from Guinea, Sierra Leone and Liberia. Currently U.S. news cameras have shifted their fickle focus to visions of Thanksgiving, Black Friday shopping, and the grand jury verdict in Ferguson, which is a travesty, yet the Ebola virus continues to rage unabated in West Africa. Regional reports place the official estimates of infection as low, as many in these remote locations and in urban city centers, withdraw with ill family members to care for them at home, as Ebola treatment centers remain full and lacking adequate resources, which often spreads the deadly disease among closed doors. While this is the worst outbreak on record, it is interesting to take a look at some of the other outbreaks of infectious diseases that have occurred over the last couple years. It’s noticeable that there is a steady and persistent knocking at the door to the human world of opportunistic viruses seeking to mutate in order to jump from animal-to-human, then human-to-human, and transmit through an airborne mechanism. 07-18-14: Scientists knew it was coming, and now it’s here: The first U.S. cases of chikungunya, a virus carried by mosquitoes that can cause fever and joint pain, have surfaced in a Florida man and woman who have not traveled to any of the foreign countries where the disease is common, according to the CDC. 05-04-14: Health officials confirmed the first case of an American infected with a mysterious virus that has sickened hundreds in the Middle East. The man fell ill after flying to the U.S. late last week from Saudi Arabia where he was a health care worker. He is hospitalized in good condition in northwest Indiana with Middle East respiratory syndrome, or MERS, according to the CDC. 11-27-13: Chinese health authorities have identified a brand-new type of bird flu that killed an elderly woman in November and infected at least one other person in January. That trend prompted the experts to call for stepped-up surveillance to track the new H10N8 influenza virus in poultry markets and in human patients. Genetic analysis of the H10N8 influenza virus revealed that it has two mutations that make flu viruses more virulent in mammals. 04-16-13: A new strain of bird flu has been reported in China, and it has sickened 63 people and killed 14. The CDC was concerned that this virus, called H7N9, will spread further, affecting more people in China and beyond. Another fear is that the virus will mutate and develop the ability to spread easily from person to person. 04-24-13: As the death toll from China’s bird flu outbreak rose to 22, the WHO warned the H7N9 virus was one of the most lethal that doctors and medical investigators had faced in recent years. They’ve already seen adaptations in this virus that makes it suitable to humans: It can attach to cell receptors in our respiratory tracts and grow at our body temperature. Another concern is that unlike previous strains of bird flu, this strain doesn’t seem to harm birds. It can spread among flocks silently, making its movement quite difficult to track. It’s a truly nasty virus. It’s been four years since the outbreak of the H1N1 virus, more commonly knows as swine flu. Normally, influenza viruses infect only one species: bird viruses infect birds; human viruses infect humans; and so on. When viruses jump species you have to watch out, because the virus might learn to spread from person to person in a population that doesn’t have immunity. Reports submitted by China’s farm ministry to the OIE last week showed that the first case of H7N9 in birds was found on April 4 on a pigeon destined for human consumption in a wholesale market in Shanghai. Authorities also discovered seven infected chickens in the same market, which lead to the culling of 20,536 poultry in total. The next day, one infected chicken was found at the Jingchuan market in Shanghai, and two chickens and two pigeons were discovered at the Fengzhuang market, also in Shanghai, reports showed. 04-11-13: China found new cases of bird flu in five live bird markets in the eastern part of the country, a report posted on the website of the World Animal Health Organization OIE showed on Wednesday. China said the H7N9 avian influenza virus was found on Wednesday in three live bird markets in Jiangsu province, one in Anhui province and one in Zhejang province, the report said. Nine people have died out of 33 confirmed human cases of the virus. 04-04-13: The death toll from a new strain of bird flu rose to five in China, as Beijing said it was mobilizing resources nationwide to combat the virus. Japan and Hong Kong stepped up vigilance and Vietnam banned imports of Chinese poultry. The H7N9 bird flu strain does not appear to be transmitted from human-to-human but authorities in Hong Kong raised a preliminary alert and said they were taking precautions at the airports. At total of 14 people in China have been confirmed to have contracted H7N9, all in the east of the country. In 2003, authorities initially tried to cover up an epidemic of Severe Acute Respiratory Syndrome (SARS), which emerged in China and killed about 10 percent of the 8,000 people it infected worldwide. 03-29-13: A decade after sever acute respiratory syndrome, or SARS, swept through Hong Kong and then around the world, the city is among the first to become worried about the emergence and spread of another, genetically related virus in the Middle East. The WHO announced that the virus, known as a coronavirus, had killed 11 of the 17 people infected. 03-24-13: They’ve been called “nightmare bacteria” – deadly superbugs known as CRE that strike hospitalized patients and kill as many as half who get bloodstream infections. Experts say the problem is fueled by the overuse of antibiotics and gaps in infection control in hospitals and long-term care facilities – the same problems that give rise to other pernicious, healthcare-associated infections such as MRSA and C.difficile (commonly called C. diff). 02-18-13: Infectious disease experts say they wouldn’t be surprised if a new virus that sickened 12 people and killed five shows up in the United States. The first cases of the novel coronavirus, which is in the same family as SARS and the common cold, were found to have occurred in an Amman, Jordan, hospital in April 2013, according to CDC. People have also become infected in Qatar and Saudi Arabia. The WHO announced Saturday a new case in the United Kingdom. The new virus, which WHO is calling NCoV, or novel coronavirus, has a range of effects. One patient in the United Kingdom had only mild symptoms, but others have suffered pneumonia and kidney failure. 02-15-13: Mexico’s animal health agency says a bird flu outbreak at seven farms in central Mexico has affected as many as 582,000 chickens. An outbreak of the H7N3 bird flu virus in western Mexico in 2012 led to the slaughter of more than 22 million hens and caused price increases in chicken and egg products. 02-13-13: A third patient in Britain has contracted a new SARS-like virus, becoming the second confirmed British case in a week and showing the deadly infection is being spread from person-to-person, health officials said. The latest case, in a man from the same family as another patient, brings the worldwide number of confirmed infections with the new virus – known as novel coronavirus, or NCoV – to 11. 02-11-13: A new virus from the same family as SARS that sparked a global alert last September has been found in another patient in Britain. The latest case of infection with the new virus known as a coronavirus brings the total number confirmed globally to 10, of whom five have died. 01-10-13: A new strain of the winter vomiting disease norovirus has spread to France, New Zealand and Japan from Australia and is overtaking all others to become the dominant strain in Britain. The norovirus variant is known as Sydney 2012. It does not carry worse symptoms than others, but like the other norovirus strains, it can cause violent and projectile comiting, diarrhea and sometimes fevers, headaches and stomach cramps. 01-10-13: The flu has been spreading fiercely across the United States, with more than half of states reporting widespread activity. The season has started earlier, and cases are more severe than last year. The latest CDC flu advisory report suggests that 41 states have widespread influenza activity, which was an increase of 31 states from the previous week. There have so far been 2,257 hospitalizations associated with laboratory-confirmed flu virus, the CDC report said. Among children, there have been 18 deaths reported during the season. 01-10-13: With flu cases in Boston up tenfold from last year, the mayor declared a public health emergency on Wednesday as authorities around the United States scrambled to cope with a rising number of patients. U.S. health authorities say the flu arrived about a month earlier than usual this year, and the flu strain making most people sick – H3N2 – has a reputation for causing fairly severe illness, especially in the elderly. As a result, hospitals around the country have been forced to find additional space to treat the ill, and some have had to turn people away. In Illinois last week, large numbers of sick people overwhelmed some hospitals , and 24 facilities had to turn away some sick people, more than triple the seven hospitals that turned patients away in the same week last year. Lehigh Valley Hospital, outside Allentown, Penn., on Tuesday set up a large tent outside its emergency room, which it is using to see patients who arrive with less-severe flu cases. In Maine, health authorities reported a “significantly higher” than normal number of flu cases and warned residents this week to expect flu activity to remain high for the next few weeks. In Weymouth, Mass., outside Boston, South Shore Hospital received approval from state regulators to move patents ahead of schedule into 10 rooms it was renovating to accommodate the influx. 11-01-12: The National Park Service has reported 10 confirmed cases of hantavirus infection at Yosemite National Park, with three of the confirmed cases being fatal. 10-10-12: Brain-eating amoebas kill 10 in Pakistan. A waterborne, brain-destroying species of amoeba has killed 10 people in Karachi, Pakistan, this year, prompting local water officials to increase the amount of chlorine in the city’s water supply and advise residents to use sterilized water when performing a Muslim ritual which involves cleansing the nostrils. The amoeba, known by the scientific name, Naegleria fowleri, is virtually impossible to detect in the water and its presence in humans is determined by spinal tests. According to the CDC, the Naegleria fowleri amoeba causes a severe brain infection called primary amebic meningoencephalitis. The disease is usually fatal. 09-25-12: A case of human West Nile virus has been confirmed in Bourbon County, Kentucky. The infection was confirmed by Bourbon Community Hospital in Paris. Texas, and especially the Dallas area, has had the largest outbreak of West Nile in years. It has reported 1,225 cases and 50 deaths as of Sept. 18, according to the CDC. Nationwide there have been 3,142 cases of human infection and 134 deaths this year, the highest numbers reported since 2003. 09-24-12: The WHO said Monday it was too soon to say whether there could be an outbreak of a SARS-like killer respiratory disease after health officials in Britain announced they detected a related virus in a severely ill patient from the Middle East. The man in the new case was sickened by a coronavirus, from a family of viruses which causes most common colds but also includes the virus that causes SARS, or severe acute respiratory syndrome. In 2003, SARS killed some 800 people, mostly in Asia. 09-15-12: A deadly germ untreatable by most antibiotics has killed a seventh person at the National Institutes of Health Center in Maryland. NIH officials said the Minnesota boy died Sept. 7. He arrived at the research hospital in Bethesda in April and was being treated for complications from a bone marrow transplant when he contracted the bug. He was the 19th patient at the hospital to contract an antibiotic-resistant strain of KPC, or Klebsiella pneumonia. The outbreak stemmed from a single patient carrying the superbug who arrived at the hospital last summer. 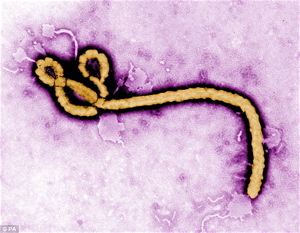 09-13-12: An outbreak of the deadly Ebola virus in the Democratic Republic of Congo risks spreading to a major town if not brought under control soon after the death toll doubled within a week, the World Health Organization warned. The number of people killed by the contagious virus for which there is no known treatment rose to 31, including five health workers. 09-10-12: The death of a 61-year-old Ohio woman is the first in the nation associated with a new flu strain. The woman was from central Ohio’s Madison County and died this week following an illness she contracted after having contact with hogs at the Ross County Fair. The woman had underlying medical conditions, but the H3N2v influenza virus may have contributed to her death. The strain was found in U.S. pigs in 2010 and people in July 2011. 09-06-12: Health officials report record numbers of West Nile virus this year – 2,118 cases as of Wednesday, up 33 percent from last week. This year’s death toll also rose to 92, up from 66 last week. There have been human cases in 44 states. The mosquito-borne disease is hitting Texas hardest, 1,013 cases and 40 deaths. You were right about the danger of ebola way back in the 00’s. Nice piece.